Immunogen: Synthetic peptide corresponding to a portion of human Bcl-2. Scientific Background: Bcl-2 alpha and beta are alternatively spliced isoforms of 25 kDa and 22 kDa integral membrane proteins that typically inhibit apoptosis; however Bcl-2 can also be pro-apoptotic. Bcl-2 is found in the mitochondrial, ER and nuclear membranes, and its subcellular location appears to affect whether it is pro-apoptotic or anti-apoptotic. Bcl-2 becomes pro-apoptotic when it is either cleaved by caspase-3 or targeted to the mitochondrial membrane. When Bcl-2 is targeted to the ER membrane, it protects cells from apoptosis induced by Bax overexpression. ER membrane Bcl-2 may protect against apoptosis by preserving the integrity of the mitochondria after an apoptotic stimulus. Bcl-2 family members are characterized by at least one of four Bcl-2 homology domains (BH1-BH4). Anti-apoptotic Bcl-2 proteins contain BH1-BH4 while pro-apoptotic proteins contain either BH1-BH3 or BH3 alone (e.g., Bad, Bid). 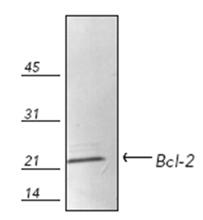 Western blot analysis of monkey Vero cell lysate probed with Bcl-2 pAb.